VALLETTA – EU leaders offered African counterparts aid and better access to Europe at a summit on Wednesday in return for help curbing chaotic migration across the Mediterranean and promises to take back those Europe expels. With Europeans’ attention now gripped by over half a million Syrians and others whose arrival has plunged the EU into crisis, memories have faded of the drowned Africans whose deaths in April prompted the Malta summit. Refugee haven Sweden imposed border controls as the leaders met. But a 17-page Action Plan, seen by Reuters, to be signed in Valletta on Thursday, sets out dozens of initiatives. Many build on decades of stuttering cooperation between the world’s poorest continent and wealthy but ageing Europe, where many leaders are uneasy about their proximity to Africa’s booming population. Some are newer, including a European pledge to drive down costs for sending money home from Europe to Africa — a nod to African governments’ concerns that curbing migration could crimp remittances from expatriate citizens that are estimated to bring twice as much to Africa’s economy as foreign aid donations. And EU officials highlighted renewed offers to ease visas and other access for African business and other travellers from countries that agree to take back citizens whom EU states want to expel as illegal aliens. Barely a third of Africans ordered deported from Europe actually leave at present, EU data shows. Under a pilot scheme, African states will send officials to Europe to help identify those of their citizens whom they would accept. Many destroy documents to thwart efforts to expel them. Meeting amid the ramparts that put Malta, the EU’s smallest state, at the heart of power struggles across the Mediterranean for centuries, European leaders insisted, despite African claims to the contrary, that they would not build a “Fortress Europe”. “Mobility between our continents is a driver for growth on both sides,” European Council President Donald Tusk told fellow leaders. Legal migration routes to Europe would remain open, promised Tusk, a former Polish premier who has been critical of what he sees as Europe’s failure to defend its own frontiers. Financial and other assistance would be stepped up, he said, targeting “root causes” driving Africans northward, including poverty and conflict as well as climate change. 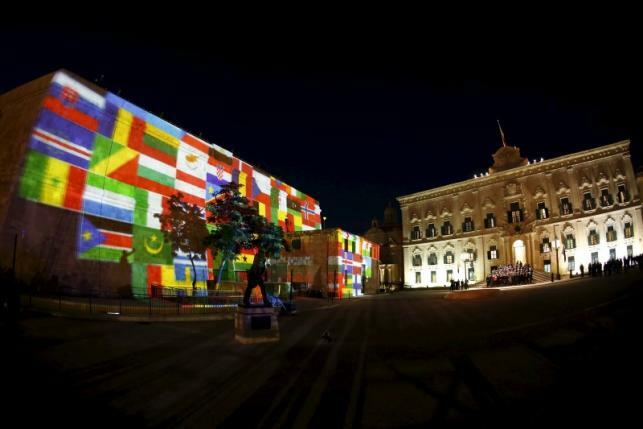 States have been slow to match 2.8 billion euros (£1.98 billion) pledged by the EU executive but leaders were delivering additional promises in Valletta. But the assistance will come at a price. German Chancellor Angela Merkel, under ferocious pressure at home and from her EU neighbours after accepting up to a million asylum-seekers this year, said the aim was a “comradely” relationship with Africa. Tusk made clear that African states had a legal obligation to take back citizens being deported and that Europe, while preferring to persuade people to leave and offering help with building a better life at home, would force out the unwilling. “Non-voluntary return is a prerequisite for a well managed migration policy,” he told the assembled national leaders. African officials and leaders made clear they welcomed the offer of cooperation but voiced reservations on some issues. Macky Sall, the president of Senegal, said he had to consider those who had “braved death” to cross deserts and seas to reach Europe and those who died on the way. He called on Europeans to regularize the status of those who had made it. Nkosazana Dlamini-Zuma, the former South African minister who runs the African Union executive, pointedly reminded Europeans it was they who had migrated and colonised much of the world and that most African migrants did not leave Africa. She hit out at what she called plans for migrant “processing centres” in Africa that she said would in effect mean detaining Africans in poor conditions, subject to abuse and radicalization. EU officials insisted the planned centres will offer migrants only information and an initial assessment of asylum claims. Her call to modernise Africa to employ its fast-expanding legions of young people and break dependence on selling raw materials was echoed by French President Francois Hollande. “If we don’t understand that we must invest massively in the development of Africa, then in the coming years we will keep on always having these flows of migration,” he said. After African delegations depart on Thursday, EU leaders will hold an emergency summit of their own, to review slow progress in implementing measures to control the flow of refugees through Greece and negotiations with Turkey to get Ankara’s help in slowing departures of Syrian refugees.